Gilbert Aguirre is a graduate of Tucson High School (1953) and of the University of Arizona (B.S. – Animal Science 1957). Gilbert received a Lifetime Achievement Award from the University of Arizona in 2009 for his unwavering support of the University of Arizona College of Agriculture and Life Sciences. Mr. Aguirre is responsible for the ranching, farming, and agricultural and industrial leasing, and daily land management of Orange County, California’s 23,000-acre Rancho Mission Viejo and all the ranches related to ranching interests. He is a member of Rancho Mission Viejo’s Executive Committee and has participated in all major land development decision making for more than forty years. 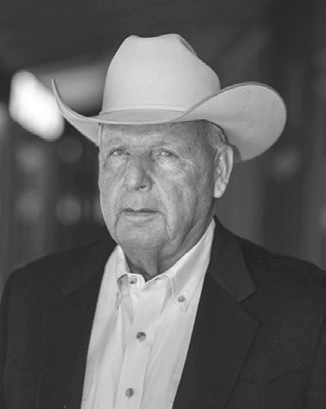 Gilbert Aguirre has long been recognized and acknowledged as a leader in the ranching industry. He has been the Managing Partner of the North Folk Cattle Company for five decades. He was an owner and General Manager of the historic 300,000-acre PX Ranch at North Folk, Nevada for three decades. Mr. Aguirre is a member of the National Cattlemen’s Association, the Nevada Cattlemen’s Association, and past President of Producers Livestock Marketing. He is a director at the National Cowboy & Western Heritage Museum, the Shea Therapeutic Riding Center, and is in the 2016 O.C. 500 Business Journal Hall of Fame. 2008, Mr. Aguirre was elected to the California Rodeo Hall of Fame.